Everest Base Camp Trek with Island Peak Nepal Trek or we named it Island Peak Climbing or Island Peak Trek is best suited for those who are seeking trekking and climbing experiences. No worries , our Sherpa climbing guides will be there to help you every step of the way. Island Peak Nepal Trek takes you all the way to Everest Base Camp at 5364m. It has been the launch pad for Everest Summit for many a climbers since Edmund Hillary and Tenzing Norgay Sherpa. 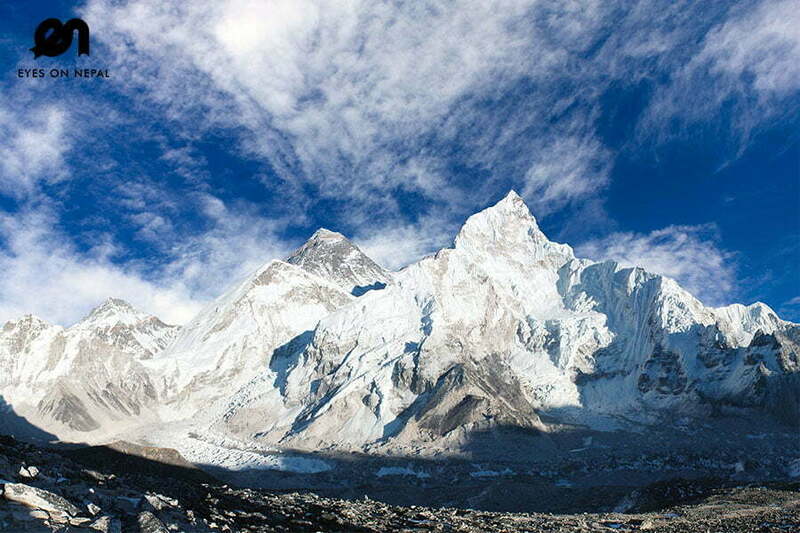 You will also climb Kala Patthar (5643m) which is a 2 hours climb from Gorakshep to see the amazing view of Mt. Everest. On your way back you will approach the Island Peak, one of the most popular trekking peaks, standing 6189m tall. Climbing Island Peak Nepal will be a challenging ordeal as you will have to learn to use ice axe, glacier walking and tackle rock and ice. 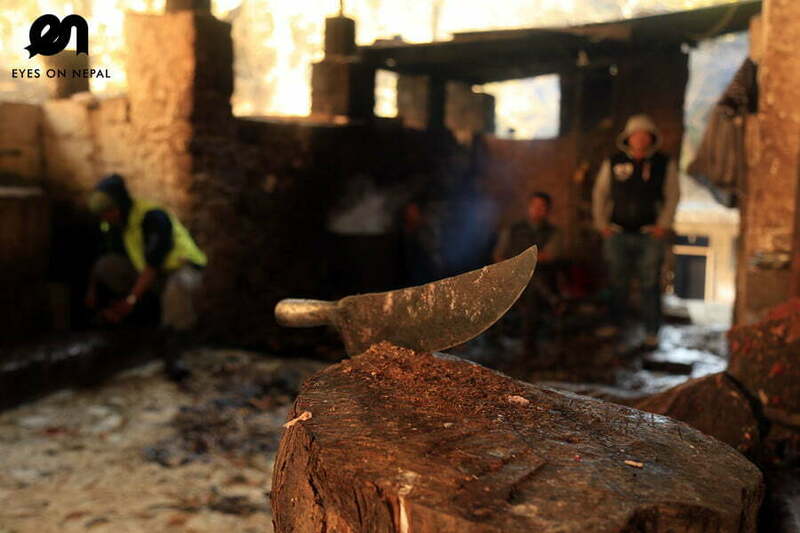 You will also visit Namche Bazaar and Lukla, two Sherpa capitals, to learn more about Sherpa culture and hospitality. Day 13: Island Peak Base Camp (5090m) to Island Peak(6173m) and back to Island Peak Base Camp and downhill trek to Chukhung! 8.00 am Start trek to Chheplung (2660m) for two hour. Note: You will see Kusum Khanguru Peak on right hand sight. Highlights: Exploring natural and cultural beauty of Everest region. Hiking to Everest View hotel 3900m. It is 2.5 hrs uphill treks. Rest and explore the area. This point offers beautiful views of Kwangde, Thamserku, Kusum Kanguru, Kangtega, Ama Dablam, Island Peak, Peak 41, Lhotse, Lhotse Shar, Nuptse, Everest, Tabuche peak, Cholatse peak, Khumbila etc..
Back to hotel.Lunch& Dinner in hotel. Highlights: Mountain views , villages and Monastery. 02.00 pm: Arrive in TengbucheMonastery(3860m) and overnight. Note: You can see the beautiful views of Everest(8448m), Nuptse, Ama Dhablam and many more. Dinner at hotel. 08:00am: Start downhill trek to Deboche(3770m) for 30 minutes and continue the trek to Pangboche(3930m) for 1 hour. 09.30am: Arrive in Pangboche(3930m) and continue the trek to Shomare(4070m). 10.30am: Arrive in Shomare(4070m). You will have your lunch here. 11.00am: Start the trek to Dingboche (4360m). 01.00 pm: Arrive at Dingboche (4360m), Check in hotel and overnight at Dingbuche. Dinner at Hotel. Trek to Nagarjuna(5000m) for 4 hours and see the beautiful views of Amadablam, Makalu, Barunche, Chopolo II, Merapeak. Or you can trek to Chukhung Village(4750m) for 3 hours and explore the village. It will take 2 hours to be back from either Nagarjuna or Chukhung village. 08.00 am: Start the trek after the breakfast to Dugla(4600m) for 2 hours. 10.00 am: Arrive at Dugla(4600m) and tea break. 11.00 am: Start the uphill trek to Lobuche (4940m) for 3 hours. 02.00 pm: Arrive at Lobuche(4940m) and check in hotel. Lunch and dinner at hotel. Overnight in Lobuche(4940m). Note: You can see amazing view of Nuptse, Cholatse and Taboche Peak(6495m). 08.00 am: Start the trek after breakfast to Gorakshep(5170m). It is 3 hours’ uphill trek. 11.00 am: Arrive in Gorakshep (5170m). Check in hotel and lunch at hotel. 12.00 pm: Start trek to Everest Base Camp (5300m) for 3 hours. 03.00 pm Arrive in Mt. Everest Base Camp (5300m). NOTE: You will see the views of Nuptse, Everest south shoulder, Chamgtse(7543m) Lingtren(6713m), Khumbutse(6639m) and Mt. Pumori(7138m) on left hand sight. We won’t spend more than 30 minutes because of windy condition. 03.30 pm: Back to Gorakshep(5170m) for 2 hours. 05.30 pm: Arrive in hotel and dinner at Hotel. Overnight in Gorakshep(5170m). 04.00 am: Wake up and you will do an uphill trek to Kala Patthar (5545m) for 2 hours. Note: You can see beautiful sunrise view and mountain likes Everest, Nuptse, Mt Pumori, Amadablam etc. We will rest for 30 minutes. 06.30 am: Start downhill trek back to Gorekshep (5170m) for 1 hour. 07.30 am: Arrive in hotel and breakfast at hotel. Check out hotel after breakfast. 10.30 am: Arrive in Lobuche (4940m) and continue the trek to Dughla (4600m) for 2 hours. 12.30 pm: Arrive in Dughla and lunch at Dughla (4600m). 01.00 pm: Start the trek to Pheriche (4280m) for 2 hours. 03.00 pm: Arrive in Pheriche (4280m). Check in hotel and overnight in Pheriche. Note: This is easy day after yesterday’s hard trek. Enjoy the day. 08.00 am: Start trek to Chukhung (4750m). 09.00 am: Arrive in Dingboche (4360m) and continue the trek to Chukhung(4750m). 11.00am: Arrive in Bibre(4570m) and continue the trek to Chukhung(4750m). 12.00am: Arrive in Chukhung(4750m). Overnight in local lodge in Chukhung. NOTE: Lunch and dinner in lodge. 07.00 am: Wake up and have breakfast. 08.00 am: Stat the trek to Island Peak Base Camp: Again another uphill trek! 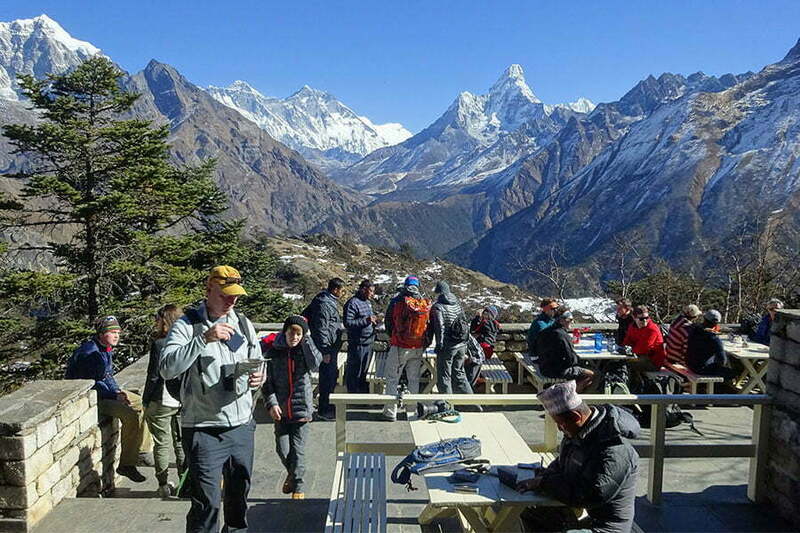 Note: There is no lunch place during the trek between Chukhung(4750m) and Island Peak Base Camp (5090m). So, we will take packed-lunch. 02.00pm: Arrive in Island Peak Base Camp. Overnight in local lodge. NOTE: Dinner at Island Peak Base Camp. Highlights: Prepare to climb Island Peak! 08.00 am: Wake up and have breakfast. 09.00am: We prepare for climbing practice. Its about 3 hrs training for next day climbing. After breakfast you will have pre-climbing training. Our guide will inform you about climbing, weather, preparation and techniques. He will also teaches you the proper ways of using climbing gears such as the ice ax, climbing boots and crampons, harness, ascender, etc. You will also have training about using ropes to go up and down. Island Peak Climbing may not demand such hard training for climbing but we strongly believe that some training experience will boost your confidence and climbing skills to increase the chances of scaling the summit as well as to fully enjoy the experience. Normally, you will be climbing on rock surface for up to around 5770m. After that, you climb on ice and we will use ropes when necessary. However, depends upon the season, temperature, climate and crevasses determines the use of the rope and the length. NOTE: Breakfast, Lunch and Dinner at Tent or Temporary hut in Island Peak Base Camp. Highlights: Summit of Island Peak and view from top! 01.00 am: Wake up and have breakfast, and prepare for Island Peak Climbing! 01.30am: Start climbing to Island Peak. 07.00am: You will be in top of Island Peak summit. Enjoy the moment. Take some amazing photos and feel the fresh air. NOTE: This is one of the toughest days of your journey. You will wake up early at around 1 am and will have quick breakfast. We start the climb early because it is a must to reach summit before 11 am because of the strong wind in the highlands, and the wind might disturb our goal and achievement (summit). Your climbing guide will lead you to the summit. He will fix a rope wherever necessary. You will be guided safely to summit by using fixed rope and man rope. After reaching on summit, you will enjoy the summit view. You will forget everything when you will see the amazing view from the summit. You will have some time there for taking pictures. 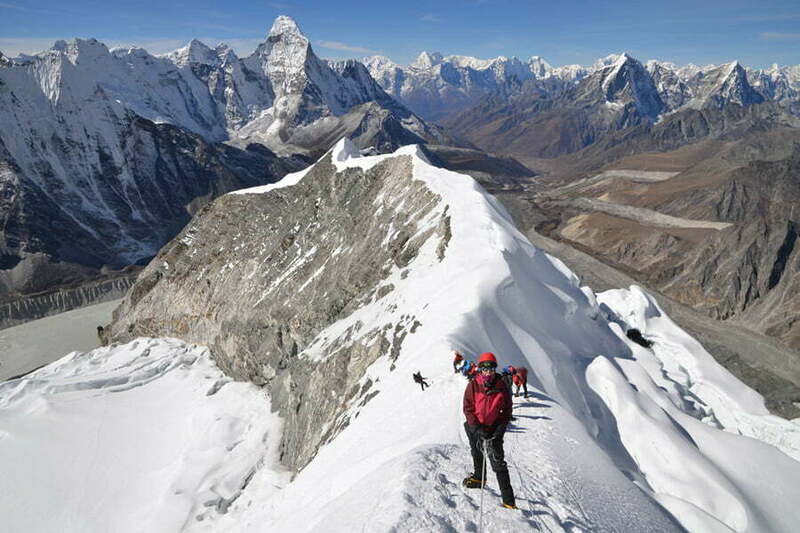 After some time, you will descend all the way to Island Peak Base Camp where your other trekking crews are waiting. Congratulation you are the Island Peak Climber! 07.30am: Start downhill trek to Island Peak Base Camp. 09.00am: Arrive at Island Peak Base Camp. Have some food and little rest at base camp. 10.15am: Start downhill Trek to Chukhung. 05.00pm: Arrive in Chukhung. Overnight in local lodge in Chukhung. Note: High-tea and dinner in lodge. 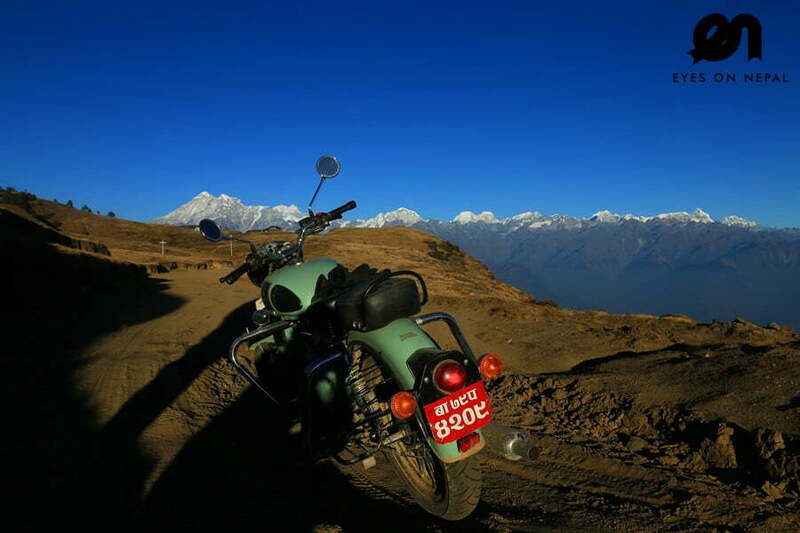 Highlights: Downhill trek to Tengboche. 08.00 am: Start the downhill trek to Tengboche. 09.30am: Arrive in Dingboche(4360m) and continue the trek to Shomare(4070m). 01.00pm: Arrive in Pangboche(3930m). Lunch at Pangboche. 04.30pm: Arrive in Tengboche(3860m). Overnight in lodge at Tengboche. NOTE: Dinner at hotel/lodge. Visit Tengboche Monastery on free time. 08.00 am: Stat the downhill trek to Namche Bazaar. 02.30pm: Arrive in Namche Bazar. Overnight in lodge/hotel in Namche Bazaar. Enoy the free and easy time by visiting Namche Bazaar. NOTE: Dinner at the lodge. Highlights: Feeling easy on breathing and beautiful Sherpa villages. 09.30 am: Arrive in Hilari Bride and continue trek to Jorsale(2810m) for 30 minutes. 10.00 am: Arrive in Jorsale (2810m) and continue the trek to Monjo(2840m) for 30 minutes. 11.30 am: Arrive in Toktok (2760m) and continue the trek to Phakding (2610m) for 45 minutes. Lunch at Phakding(2610m). 09.00 am: Pick up from Kathmandu Airport and drive to your hotel in Kathmandu or your next destination. Trek ends! Congratulation! You completed your Everest Base Camp Trek with Island Peak Climbing 17 days 16 nights! NOTE: The price above is quoted based on 2 people. 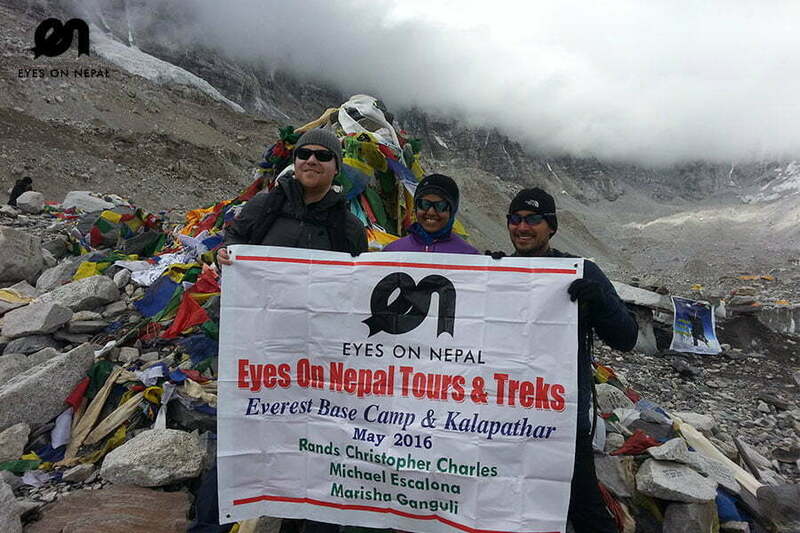 If you are travelling in a group of more than 2 people, kindly write to us at sales@eyesonnepal.com, we will give you a special quotation. There will be another rule if Nepal tourism board changes the peak climbing rule and regulation. Accommodations x 16 nights in the mountains. NOTE: Base on twin sharing and in some of the places you will sleep at hall. It depends upon the touristic season. We will do our best to provide your own room. • Pick up from your hotel transfer to Airport on day 1. • Pick up from Airport and transfer to Hotel on day 17. 1 trekking guide & 1 porter (maximum 20kg luggage) will be provided during your treks. 1 Climbing Guide will be provided during climbing . Sleeping bag, down jackets, walking stick, and other climbing gears on necessity. First aids kids, water purified tab & all necessary in mountains. Travel and peak climbing insurance that cover air lifting facilities. Travel Insurance for trekking and climbing crew.